Let’s take a simple example, using the SPDR SPY from inception. It’s had three great bull markets, the last part of the 90s, 2003-2007, and starting after the financial crisis of 2008. It’s difficult to complain about the returns, 9.32% per annum, even after all the ups and downs. As our benchmark, we start with $1 million on February 1, 1993, and calculate the compounded returns of SPY to get 9.3% annualized. If we need $50,000 to live on each year, we’ll withdraw $4,166.66 at the end of each month. That reduces the amount of capital we can invest the following month. Each month we apply the SPY percentage returns to the previous month’s ending asset value and subtract the monthly withdrawal. We calculate the new monthly return and compound that in the usual way to get the NAV shown in Chart 1, marked “W/D 50K”. 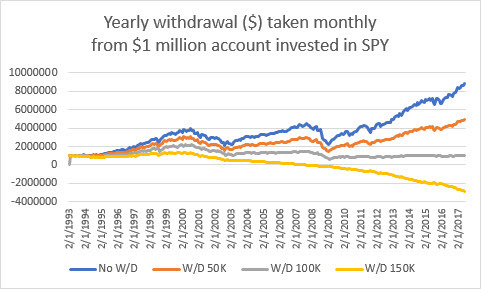 Chart 1 Monthly withdrawals of fixed dollar amounts, from a passive SPY account, based on an annual amount. The impact of a $4,166 monthly withdrawal isn’t too bad. If our daughter could live on that (hypothetically, of course), the equity still grows. But she really wants to withdraw $100K each year, or $8,333.33 per month. That gives us the gray line in Chart 1, essentially removing all profits and always keeping about the same as the starting investment. That leaves little room for error. What if she needed even more? As you can see by the yellow line in Chart 1, withdrawing $150K each year ($12,500 monthly) takes about one half the time to consume all the investment, even going negative in the middle of the 2003-2007 bull market. The market has been good to many investors, but there is a limit to what it can produce. You might think that withdrawing a percentage each month would be better, but then the amount you take out will vary considerably. Let’s look at what happens. 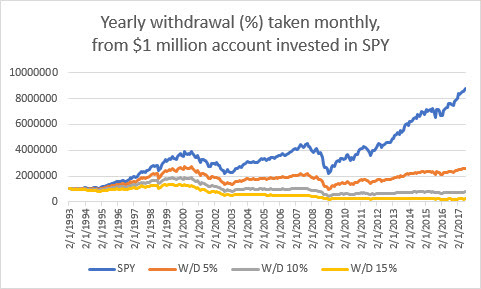 Chart 2 shows the passive SPY investment (in blue), along with the equity given monthly withdrawals based on annual amounts of 5%, 10%, and 15%. It appears that we have basically the same pattern as the fixed dollar withdrawals. The 5% option allows the account to grow, 10% removes all gains, and 15% leaves you with nothing, albeit slower than the withdrawal of $150,000 each year. 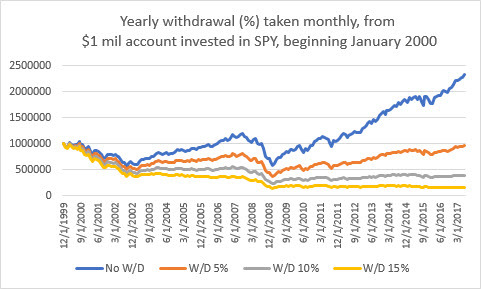 Chart 2 Monthly withdrawals of percentage amounts, from a passive SPY account, based on an annual amount. The benefit of percentage withdrawals can be seen in the monthly cash flow. A monthly dollar withdrawal of 5% is $4,166. If instead, you withdraw 5%, or 0.4166% monthly, you end up with more money to spend, shown in Chart 3. The reason is that, when the SPY is in a drawdown, you withdraw less, so when the market recovers, you have a larger investment. Over the period from 1993 you would have withdrawn an average of $7509 each month instead of $4,166. But that picture can be deceptive. It is based on beginning these calculations just ahead of a bull market scenario. 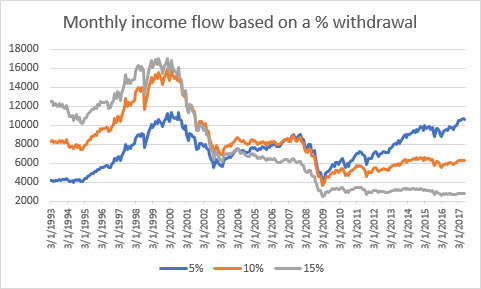 Chart 3 Monthly income flow, based on percentage withdrawals, starting January 1993. Those who traded in the 1990s should remember the remarkable bull run that ended at the beginning of 2000. What if you had started at the worst possible time, instead of the best time? Taking a 5% annualized withdrawal (monthly) would still have survived the two devastating bear markets so far since 2000. But more than 5% reduces your equity significantly, as seen in Chart 4. Chart 4 Net equity after percentage withdrawals, starting in January 2000. The real problem comes in the cash flow. Instead of accumulating profits in the late 1990s that allows you to withdraw funds for the next 20 years, you start on a downturn. At no point can you withdraw the 5% fixed amount that you want. In fact, for most of the time, you can only withdraw half that amount, and the average over all the years from 2000 is $2,943 each month (see Chart 5), rather than the $4,166 you’re looking for. 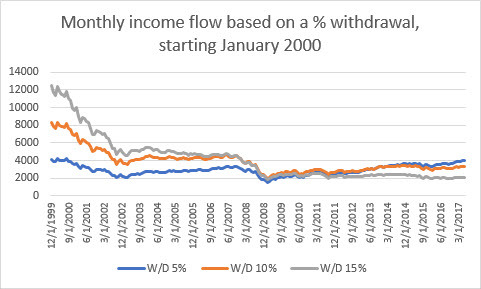 Chart 5 Monthly income flow based on a percentage withdrawal, started in January 2000. In theory, we should be able to withdraw something just short of the long-term annualized returns of our investment portfolio. If we start at a good time, when the portfolio returns perform better than average, we can accumulate extra reserves that will carry us forward for a long time. If our timing is bad and we begin ahead of a bear market, both the equity and the withdrawals work against us and we end up with much less than we wanted. There is really no way to know what the market will do. Statistically, you have a better chance of a bull market than a bear market. Perhaps the best way is to withdraw a smaller amount, say 5%, until you build equity, then increase the size of the withdrawals. It will assure longevity.